Illustration courtesy of Winchester/Olin Corp.
Over the years, scant few jacketed bullets have been developed for muzzleloading use. Originally, handgun bullets were extensively used as they were pre-existing and inexpensive, and they are still common today. Since they were designed for lower velocities than today's muzzleloaders can produce, they have often performed poorly when pushed beyond the velocities for which they were intended. Premature core separation and inadequate penetration was sometimes the result. .44 Magnum pistol bullets have been perhaps the most popular and poor accuracy with these .429 inch diameter bullets was regularly reported with the sabots of a few years ago. Even the Hodgdon Pyrodex manual notes this problem. Sabot formulations and design have improved at least four times in the last eight years, and while the old accuracy axiom may still have some validity with some jacketed bullets, it is in no way close to the clear trend of even a few years ago. Winchester/Olin came somewhat late to the muzzleloading bullet arena, but with a level of muzzleloading testing and attention that few of today's front-loader projectiles receive. The muzzleloading projectile market is still small compared to the center-fire rifle and pistol bullet markets, making development cost a correspondingly high percentage of potential income. To partially compensate for this Olin has sought to develop multi-purpose bullets, and that is the case with the Platinum Tip line. At present the Platinum Tip line consists of only a 260 grain .45 caliber bullet in a black MMP .50 caliber sabot, though a .40 / 45 offering has been announced. This is the same bullet that has already proven itself to be an outstanding hunting projectile in Winchester's high performance 20 gauge saboted slug round, and also in their .454 Casull pistol cartridges. The 260 grain Platinum Tip features a hardened, swaged lead core with the addition of about 2-1/2 percent antimony. This is the hardest lead that Winchester's swaging presses would smoothly handle. The bullet's silver colored "Platinum" jacket is one of the thickest I've seen on a muzzleloading bullet, and it features a very deep hollow point and has an exposed lead base. It was designed and tested to be the "ideal" muzzleloading deer-hunting bullet. Winchester consulted with MMP, and found that the HPH12 sabot, which appears overly long for the bullet, gave the best accuracy from their ensemble of test guns. Ballistic coefficients have been used and abused, with most published numbers from various companies devised by methods unknown. Whatever methods are used, they are almost universally inflated. Well, Winchester didn't guess. Having their own Doppler radar range on site in East Alton Illinois, they were able to pinpoint the average 200 yard G1 BC at .200, based on a 90 grain Pyrodex charge. This is one of the very few muzzleloading BC's with much real-world meaning. Pushed at 2000 fps, this bullet will retain over 1000 foot pounds of kinetic energy past 200 yards. The maximum point blank range with a 6" kill zone is about 185 yards. On to the bullet impact testing, where Winchester technicians fired rounds into deer hide covered ballistic gelatin at 100 yards, and recreated the same testing with the "four Denim" method, and added some of their FBI barrier testing procedures to further examine this bullet's capabilities at different velocities. As a result of this battery of testing, Winchester found that positive expansion, long a problem with some bullet designs, is a guarantee between 1200 and 1700 fps, with no chance of core separation. The possibility of core separation if hitting bone at velocities above 1700 fps is there, but still unlikely until a terminal velocity of about 1800 fps is reached, according to Winchester's data. Winchester found that even in the most extreme cases, the heavy jacket penetrated almost as deeply as the core itself. Based on the results reported from a wide variety of sources after the 2003 season, this bullet is an outstanding performer on deer whether fired from a muzzleloader, shotgun, or magnum handgun. Electronically weighed bullets from one new 30-pack varied from 258.1 to 259.5 grains. In testing with four different muzzleloaders, 3-shot 100 yard accuracy varied from 1" to 1-3/4" contingent on gun, when pushed by 100 grains of Triple Seven FFg. Use of the latest formulation MMP HPH 12 sabots showed no significant change with the same load, but substitution of the shorter "MMP" black sabots improved the groups by approximately on half inch in three out of the four guns, and about on quarter inch in the fourth (which was already shooting right at an inch). That seems to be a reasonable, if statistically small, trend that shows Winchester might be able to improve their product a bit with a little more attention to current sabot styles and formulations. Though personally I'm a pure lead bullet fan, Del Ramsey pointed out the one clear advantage of jacketed bullets: they arrive looking like a bullet. Inadequately packaged pure lead bullets seldom arrive looking like they should, no great surprise after handling by plane, truck, rail, and being knocked off of shelves. The Winchester Platinum Tip is one very tough bullet. Its deer bagging performance has proved to be superb, and it is available at a price point about half that of some other "premium" bullets. 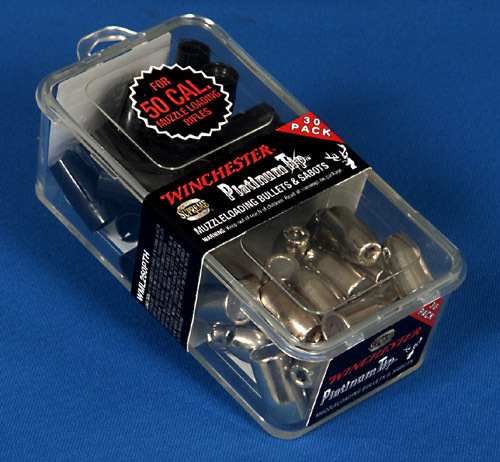 Winchester has done well, and I hope that they expand this fledgling line to include what should logically be a .40 caliber bullet weighing approximately 210 grains and a .45 caliber bullet weighing approximately 310 grains. Olin has announced that their Winchester muzzleloading bullet production has been discontinued for 2006. Their lack of a full line, the ineffective packaging, and a failure to address today's improvements in powders and sabots has hastened their demise.